Several readers commented on the post highlighting pieces from No Man Walks Alone that articles on other shops would be helpful, if objective and analytical. If there’s any area that needs this most, it’s trousers. Once men find a model that works for them, they’ll stick to it almost exclusively. The problem is trying to work out which model that is, online. The Armoury carries more brands than most: Osaku, Pommella, Ring Jacket and Rota. This variation makes it particularly hard to tell the trousers apart, as so many things vary between them. It’s different to someone like Anderson & Sheppard, which although it has 11+ styles, is consistent in finishing, materials and so on. It’s a coherent range with a smaller number of set variables, and therefore permutations. The Armoury brands vary most obviously by price, with Pommella (above) the most expensive at $800. Osaku is the next level down, around $500, with Rota a touch cheaper and Ring Jacket closer to $350. Pommella’s high price is basically down to hand work. 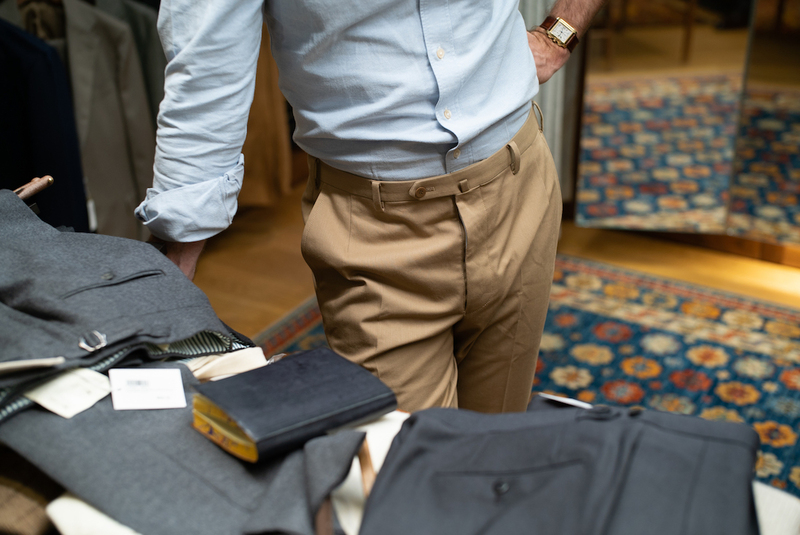 These are bespoke-level trousers for those that want the make of bespoke, but not the fit. So the buttonholes are hand-sewn, as is the skirt on the inside of the waistband, and there is visible pick stitching around the edges. Personally I’d prioritise fit over finishing, but I know there are men that love that level of finish, and don’t want to wait for trunk shows and fittings. The cut is also a pretty good fit on me - as you can see below. However, hand sewing is only one way Pommella differs from the other brands. It also has a higher rise, and a variety of different fastenings: belt loops, side adjustors and metal rings. These design details will be pretty obvious from the website, but I'd add that I found the ring fastening subtler than I expected. This might be down to the fact it's often pictured against high-contrast cream flannel or cotton (above and below respectively). Also, what’s not obvious is that you can unbutton the ring and swap it for a range of others - either to vary the look, or to have something less showy (below). Among the fabrics used for Pommella, the only one that it’s hard to get a sense of online is the reversed moleskin. This is an unusual cloth, with the moleskin's brushed exterior used on the inside rather than the outside. It's something found more in Australia, and considered very much a workwear material. It feels lovely, with the warm brushed cotton against the skin. But it doesn't drape or hold a crease - indeed, I might even press the crease out of it. There is also a flecked texture that doesn’t come across well in pictures. I’d suggest trying it in person if possible. Osaku was my favourite of the four brands. 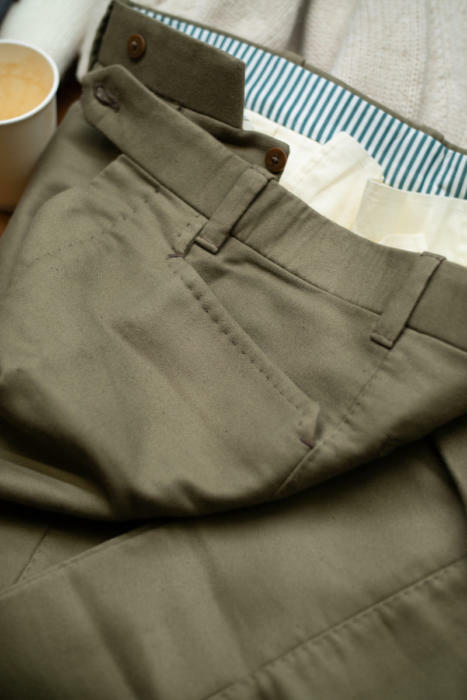 It’s still expensive for trousers at $500, but the make is very good. All by machine, but precise and clean, with nice materials including the shirting on the inside of the waistband. The leg line is similar to Pommella - slim and slightly tapered - but pretty much everything else is different: a mid-rise, a thin waistband, and just belt loops for the fastening. So while the high rise was a good fit for me (with my hollow lower back) the Osaku would have to be taken in. It also came up slightly larger than Pommella in the waist (I'm wearing a 48 in both). On materials, note that the tan and stone cottons from Osaku also have an unusual texture, with short irregular lines running down the leg. This is just about visible in the pictures online. However, that texture actually adds some nice variation, and the cotton has an effective stiffness, with a sharp crease. I'm wearing the tan cottons below. The other two brands, Rota and Ring Jacket, aren't that different in make, though Rota is a little more expensive. The fits do vary, however. Rota will be familiar to many, and is a fairly standard modern cut, perhaps best described as mid-rise. Ring Jacket, on the other hand, is carried in a 'Model A' cut developed with The Armoury, and is rather higher in the rise. Similar to the Pommella. Rota is also slimmer in the leg, and this is something I struggle with in terms of their fit. It took a while for Drake's to get their trousers made with Rota right in that regard. Of the two, therefore, I'd suggest more sartorial dressers err towards Ring Jacket. It also comes in a greater range of materials, including cottons, flannels and corduroy. 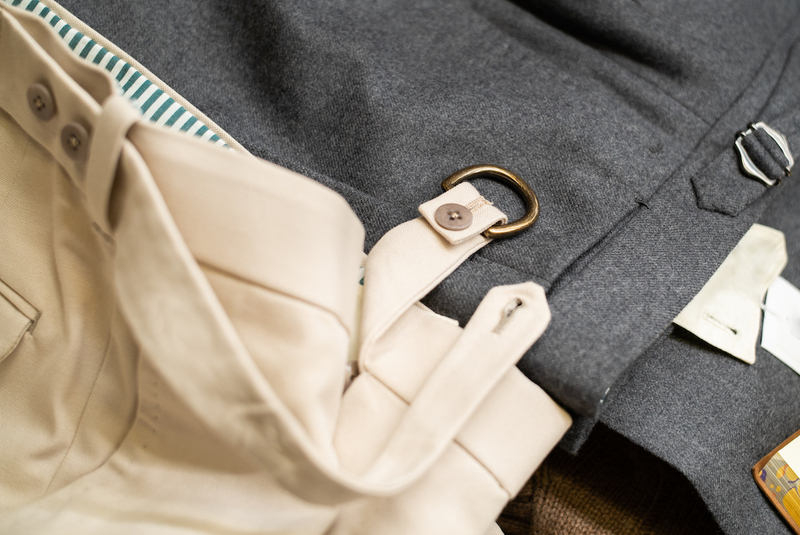 Overall, The Armoury has a great range of trouser brands. It’s hard to think of someone with a bigger one of high-end, well-made formal trousers. But the range is also evolving, with this only their second batch of Pommella and first from Osaku. Over time, the design options and cuts will become narrower and more consistent. In the meantime, hopefully this piece helps a little tell them apart - and find which of the various models is right for you. Pommella also offers bespoke through trunk shows at The Armoury in New York, which starts at $1100. Rota offers a narrow made-to-order service for $595, which is good value for them, and a fuller range of options on design and fit for $950. You can follow the discussion on The Armoury trousers: Osaku, Pommella, Ring Jacket, Rota by entering your email address in the box below. You will then receive an email every time a new comment is added. These will also contain a link to a page where you can stop the alerts, and remove all of your related data from the site. Hey Simon, any pics of you in the model a trouser? How do they compare in fit(slimness in leg etc) to the pommella? Excellent post, thanks very much Simon. Quite useful. Did you have the chance to look at The Armoury’s safari jacket by Ascot Chang? If so, what do you make of it? I already have one in tobacco linen – see post and some commentary here. What is the navy jumper in your last photo made of and where is it from. Perhaps it is just a good photo, but it looks lovely! Another Lockie! 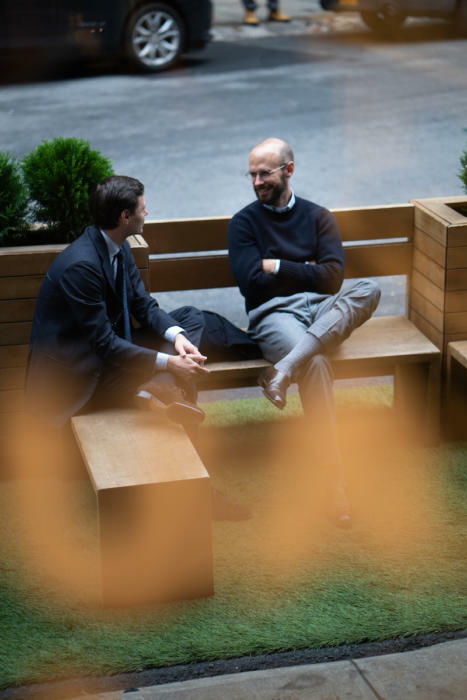 I have two pieces they made (both via E. Tautz) – a navy cashmere crew and a charcoal fisherman’s sweater – and they are my absolute favourites. Any plans to write on them soon, especially now they have their own slim-fitting range available on Mr Porter? I apologize for being pedantic, but I don’t understand how something can be ‘just about visible.’ Either something is visible, or it is not visible. Aside from that quibble, an interesting article. Of course, given the uniqueness of each person’s anatomy, buying pants via mail order seems to be a hit-or-miss proposition. This is particularly the case given the wide variety of models that many companies offer plus the fact that many retailers have their own, unique models — viz. Drakes, as you mention. That reality hasn’t stopped me from trying, but one must be prepared for a lot of effort. Indeed, very true. It’s why I wanted to offer a bit of commentary, but of course that only helps so much given it’s one person trying it. The price of these trousers is just too excessive. Obviously aimed for people with yachts ! As great as the pick stitching and hand work is the price seems sheer exploitation (all be explotation of very rich customers ). The Tailors will claim they make little as they always do . I think that’s a rather naive comment to be honest, Robin. How many tailors can you name that would really qualify as rich? Now how many designers? You may disagree with what tailors spend their time on when they make clothing – and absolutely with their quality or taste – but you can’t really argue with the amount of that time they spend. Go to Sartoria Reale in Naples, they’ll make you handmade bespoke trousers for 200 euros fabric included. You just have to manage them a bit to obtain a good and consistent result. One examples amongst a few others. 800/1000 dollars trousers is indeed a price for hongkongese business men and bankers. It can be partly justified in trunk shows but the margin is still very interesting for the tailors. A good value for money for TS bespoke trousers would be 300 euros CMT. Not saying of course tailor is the best way to become rich. There is a market and customers, mainly Asians, who are eager to pay those prices, this is true. In fact there is no “fair” prices. Money matters are Always relatives. Thanks David. 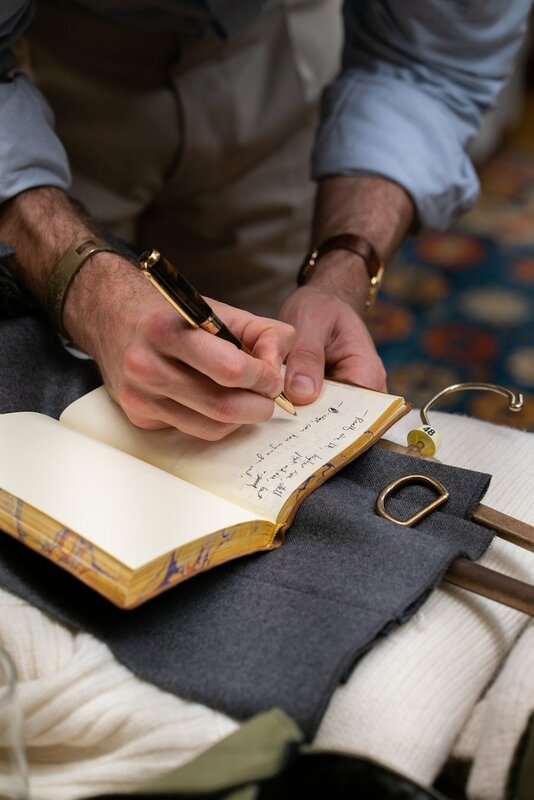 Please allow me to be a little cynical on the bespoke trousers you quote, given the price of cloth would be almost all of that, once the VAT is taken off. Certainly, the same time and finishing could not go into it as at a top-end bespoke tailor. 100 euros will largely cover essential fabrics needs (taking for basis a 1,5m unit for bespoke trousers). I recognize that 100 euros CMT is the price for locals but you can obtain it if you’re introduced and not targeted as a gringo. Of course you won’t obtain the degree of precision and the impressive hand-stitching of a pair of Ambrosi (300 euros few years ago before the Instagram booming), or Cerrato (still 300/350 euros CMT in Naples), Mola (same price than Cerrato) or Voglio. But what’s important : the hand-stitching or the fit ? The fit of course! I have some industrial pants which costed me half the prices of my bespoke ones and fit better. As you said the challenge is to find the right RTW and stick to it. The making of high-end bespoke trousers require at least 13 hours, i.e. 2 days of work. At 100 euros the daily wage, it’s still profitable for neapolitans. Thanks David, good info. I agree fit is always the most important. Still completely understand people that love the handwork and want to pay for that though. Frederick Scholte was seriously rich. He died in 1948, leaving an estate of £200,000, which, taking inflation into account, is £7.5 million in today’s money. Had the money gone into property, I presume, £200,000 would have bought the biggest mansion in Kensington Palace Gardens. Just to clarify and finish this line of argument . I think David quantifies it better then me . 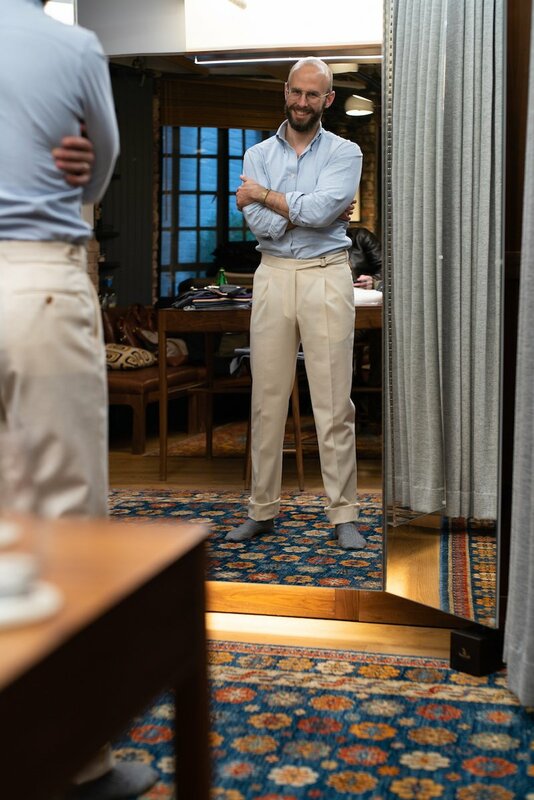 Simon , these are hand-made, RTW trousers. I think using the term ‘bespoke level’ adds to the confusion of what is bespoke ? It’s just that when you get to these amounts a voice screams in my conscious “It’s just a pair of trousers !!!”. Very informative, well written with high quality photographs. I believe this post is fantastic, as I personally wondering most on the trousers that I should wear, I strongly believe they play an important role in an outfit. Reference the Osaka tan trousers. As a belt wearer, that little loop above the zipper is becoming one of my favorite options to have. I look almost exclusively for trousers that have this now. May I just know what is the function of the loop? The prong of your belt buckle goes through it. It holds the buckle in place and secures it nicely to the trousers. Yes agreed. I’m embarrassed to say I didn’t even know what this was for a year ago. I guess we’re all learning. Thank you for this wonderful posting, Simon. I’d also mention that the Armoury has a decent return policy for most items, making online purchases a little less risky. I’d also add that Mark Cho, the Armoury’s co-founder, was instrumental in the ring design. He experimented with, and performed significant research into, its engineering and construction. I have an off-topic question for you, for which I apologize in advanced. 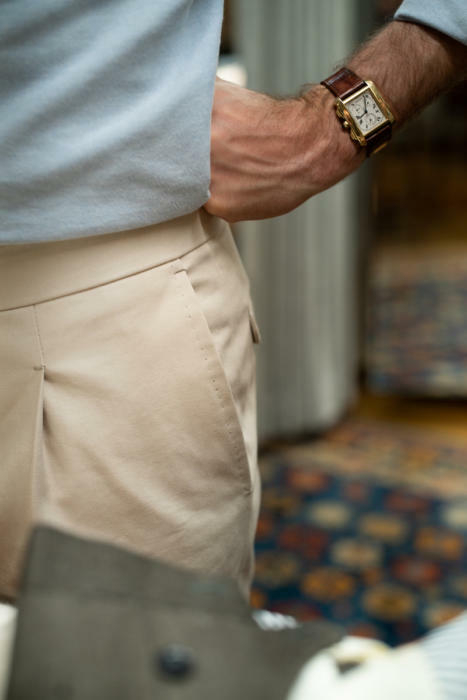 I have the same Cartier watch you have – shown in the picture above – and have been trying to swap out the bracelet for a strap for many years. Cartier refuses to do it outright. They claim they will only replace an item on a watch with the item type with which it was originally purchase. I tried to change the strap myself and the bracelet is ironclad. I’ve had unauthorized watchmakers tell me the mechanism is designed to be tampered-proof. I have found no tools that works on the screws and cannot reach the spring bars without first undoing the micro screws, which are resistant to all screw drivers I have tried. Did you have the same trouble? How do you/did you change your straps? Thank you very much – Jack. Thanks for the additions Jackson. I am struggling to grasp why someone s elegant as yourself would like those heavy stitches along the Pommella pockets? To me it looks showy and tacky, like cheap industrial make. Do all Italian makers do it that way? Maybe alternatives (you mentioned A&S lines) may be a welcome topic for another article. Unless you already wrote such an article. Hi Simon, this was a great piece. Very useful. I had been wondering about all of these specific items and their relative differences for a while. 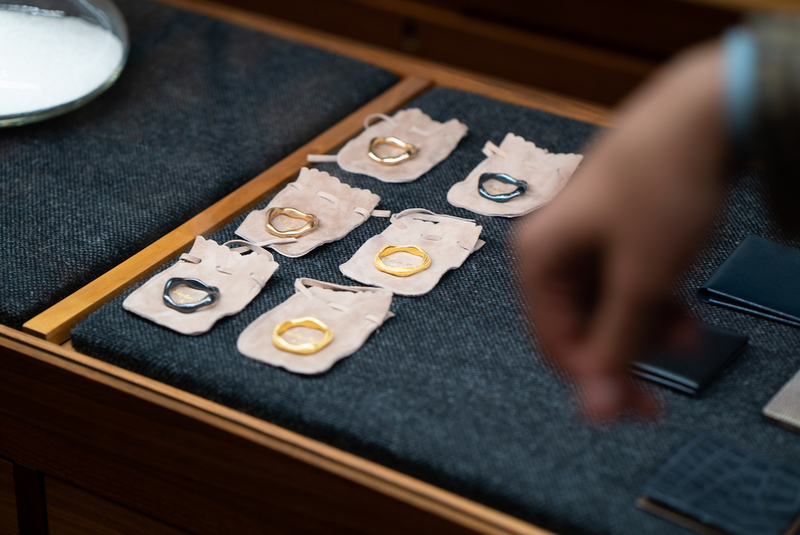 With regards to Osaku, do you know if the Armoury has any plans to do trunk shows for them out of their NYC location? Judging from photographs alone, which might not be the best way to judge, it seems that Osaku has the best fit have any bespoke maker. Firstly thanks for addressing an issue which, for many, is a niggling one – trouser fit. The commentary is detailed but a picture tells a thousand words. Shem’s point about comparative images would have told a story worth many pages. Fashion is above all things, visual. It is a small persistent weakness of PS – that the images don’t quite meet the writing. I understand the purpose of the article but David and Robin make a fair point. I can commission a pair of bespoke trousers by a tailor outside of London for £250 + cloth. I also buy RTW of a good quality but why pay over $500 (that still require alteration) when a bespoke pair, made to exact size, shape and specification (and thus of better fit) can be bought for less? Only high fashion and exclusivity of cloth would be the reason and I question whether any of the brands other than Pomella offer that. To be honest, we did try shooting the different styles, but it’s not easy to demonstrate the line or fit when worn – they largely end up looking very wrinkled, particularly cottons. Often flat product images that the shop produces are better in that respect. I’m sure you’ll be aware from our suit analysis pieces how misleading photography can be as well. I agree with the comment that outside London you can ask a tailor to make a pair of trousers for a little over £300 Inc VAT. As far as RTW goes I buy Cordings tailored chinos and have the thigh area slimmed down by a competent seamstress. You didn’t include Ambrosi in this article. What is your take on Ambrosi. How good are there trousers? No, that’s because they’re only offered in Armoury Hong Kong and I was in New York. What is your take on Ambrosi. How good are there trousers. On the topic of brand review: now that you’re doing PS full-time (heaven rejoice! ), is there any chance that you’ll give Japanese craftsmen (tailors, shoemakers) a try in the future, since the bespoke scene there is so rich? 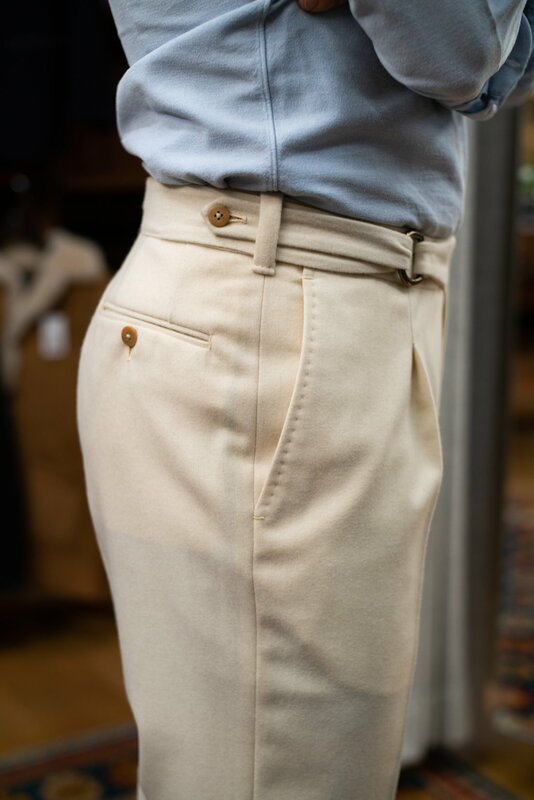 How would you compare these Rota trousers with those in terms of quality with those from Anderson & Sheppard Haberdashery, as I believe they are from Rota too? I found the A&S ones to be a very good fit for me and solid in quality. Not the handwork as some others but the handwork is not always the most important thing for me. Does the $800 for the Pommella trousers include all alterations? As far as I know, and I’ve been an Armoury client for many years, alterations are included in the price of all items, including adding button holes on working sleeves and other major tailoring operations. Making sure that people have a great fit has always been the Armoury’s primary concern. As regards the ones with belt loops (not rings), how would you utilize them, with belts or without? I can recall that you rarely wear belts, and only with chinos. Hi Simon: reflecting on the article and comments I wondered if a guide to trouser cuts might be useful. Not everyone is tall and lean and therefore fits the a-la-mode slender cut. Thinking: pipe stem, peg top, drainpipe (or skinny), single/double/inward pleats, tapered, boot (perhaps leave out Oxford bags…) and what might fit particular frames etc.? Thats a nice idea, perhaps part of the Suit Style series. Hi Simon, I like to Pomella style very much as I love these tiny details like the metal rings which can be changed. On the contrary does it not give a very casual look and does therefore less fit to a Business Outfit? Do you have contact details of Pomella as I could not find any. Overall again a very informative and I am keen on the next post. Yes, I wouldn’t say it was suitable for business wear. Hey Simon do you recall wearing your usual size for the ring jacket chinos and would you recommend sizing up? What accounts for the difference in price between the Ring Jacket and Osaku trousers?